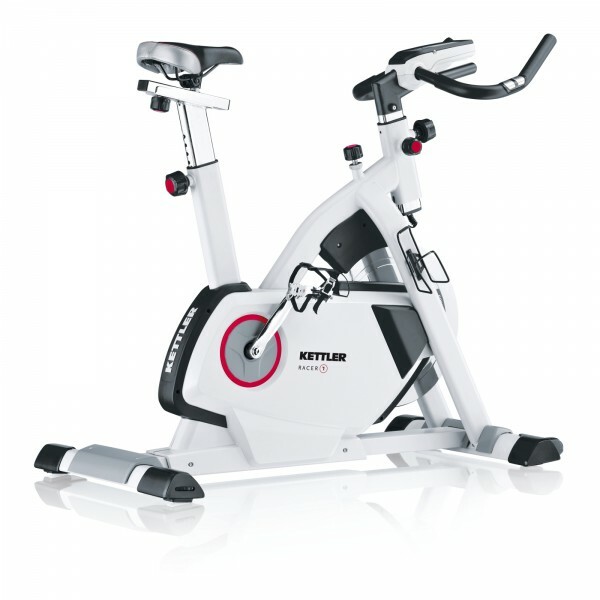 The Kettler upright bike Biketrainer Racer 1 is a solid fitness equipment for starting cycling training. It offers good conditions for your training success with an infinitely variable resistance and a target-zone training. The Kettler Racer 1 is a classic indoor bike for cycling training at home. The resistance is infinitely variable with the brakeshoe system - by a simple adjustable wheel. The Kettler upright bike Biketrainer Racer 1 has a freewheel for more safety and is good for starters. The flywheel of 18 kg provides a smooth course of motion. The upright bike is driven by a silent longitudinal ribbed belt. The Kettler upright bike Biketrainer Racer 1 has a good-to-read LCD display which clearly shows most important training data. Five functions are displayed permanently. The Kettler upright bike Biketrainer Racer 1 has heart rate measuring for target zone training, i.e. improved fat burning. When the optimal pulse zone is left, the Kettler upright bike Biketrainer Racer 1 signals whether speed or resistance have to be changed. Saddle and handlebar of the Kettler upright bike Biketrainer Racer 1 are multiple adjustable. You always have the optimal training position. Large feet and height levelling provide a safe stability even for intensive workouts. After the training, the Kettler indoor bike is easy to move with the transport wheels. Even more training functions and a motor driven magnetic brake system are offered by the Kettler Biketrainer Racer 3. Kettler upright bike Biketrainer Racer 1 add to comparison list.